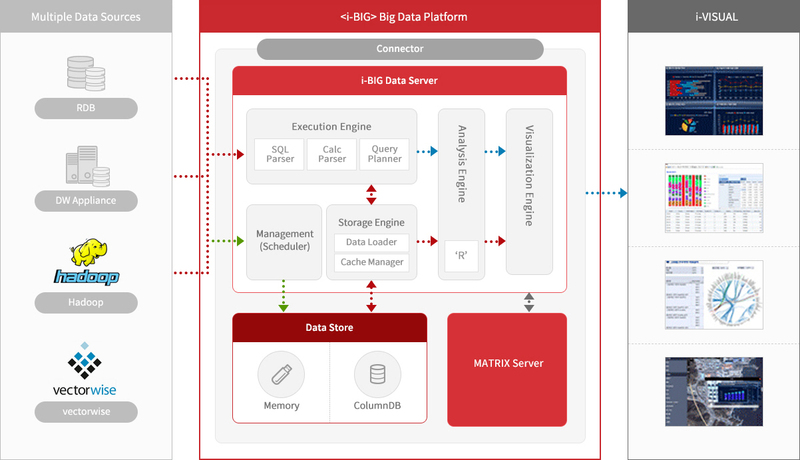 i-BIG – BI MATRIX CO., LTD.
i-BIG is Big data Analytics Platform optimized for analyzing the large volume of corporate data. It makes corporate enable to analyze big data effectively by integrating both BI/OLAP and Big data Analytics in a single platform. i-BIG provides valuable analytics result about solving issues, streamlining business management, and forecasting new business. i-BIG is analytics solution that makes massive data to be used meaningfully in your business. It is big data analytics platform that combines powerful data analytics and report-making. Big data analytics platform that combines powerful data and report analytics with big data analytics in BI solutions. : Hadoop, Hadoop Eco-system, R, Splunk, etc..
A Institution / Buildup the infrastructure of Big data related in climate and weather Merge and analyze the data that converged weather data analytics and big data of industries like agriculture, tourism and transport, And visualize its result. L telecommunication company / BS Integrated Information System Buildup the Integrated information system for self-service by being introduced In-Memory repository. And Implement the system that enable to use the extracted data at the right time from 5-6 millions of row data. Because i-BIG is an additional analysis module for large-scale data processing, it must be used with BI Matrix’s BI Solution.